Amanda Campbell, who graduated in 2015 from the The Bartlett School of Architecture's Architectural & Interdisciplinary Studies (AIS) programme, has won first prize in a national competition for her research on a biodegradable tent for music festivals. 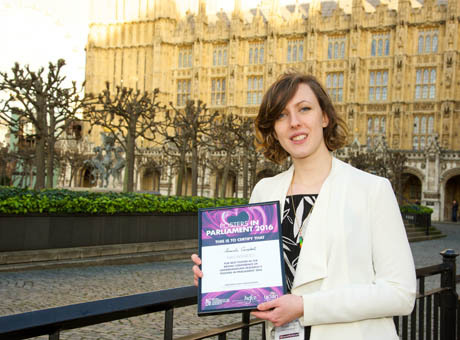 The annual Posters In Parliament exhibition is an opportunity for students to present their work, at the Houses of Parliament, to legislators and policy makers and to demonstrate they are part of a new generation of emerging researchers able to meet global challenges. Amanda’s interdisciplinary research focused on finding an environmentally sustainable alternative to abandoned temporary structures, such as festival tents, by engineering composites from biodegradable materials. Amanda comments: "I’m really looking forward to taking my research forward as a business, and I have started talking to other undergraduate students in the hope of inspiring them to make their research into something tangible." More than 40 students and recent graduates presented their work – two of whom were from UCL. The event is part of the British Conference of Undergraduate Research (BCUR) which gives undergraduates and recent graduates the opportunity to show that they have undertaken research at the cutting edge of their field.